Jenelle Montilone: The universe sends us the greatest gifts- and being a part of the BERNINA family has truly been one of them. I am lucky to work alongside and learn from some of the most talented men and women in this industry. I’ve shared intimately what it means to me to be a brand ambassador for BERNINA. While that original post was written more than 2 years ago- it is still true today. Catherine Redford: It wouldn’t take very long at all to realize that having the right tool and materials for the job is very important to me. I like first quality fabric, thread, needles… you name it and I probably have it… or really want it! So no surprise at all that I sew on a BERNINA machine (or two). Kari Carr: Basically, it’s the most common-sense method of trimming and creating half-square triangles there is. Like it says; One Alignments, Two Cuts and you trim all four sides of your block. The exclusive edge slots allow you to remove the dog ears at the same time. Simple, but effective….at least that’s what I’m hearing in the reviews. It’s also the perfect companion to the popular notion, Clearly Perfect Angles (an Amazon “Best Seller”). Lori Kennedy: There has been a lot of excitement at The Inbox Jaunt lately, because a collection of the Tuesday Tutorials (along with Skill Building Exercises and more) was just published by Martingale! Annie Smith: Gran gave a sewing machine to my sister and me for Christmas when we were in high school. It was the only thing that we could mutually share and get along with. We had a calendar on the wall in the laundry room, where our Dad set up a desk for us to sew. We scheduled our “week to sew”– one week on, one week off. We made all of our clothes (except Levi jeans – who could improve on perfection? ), including prom dresses. I made clothes on the weekends, wore them to school and took orders from my school mates. Repeat. Soon I was making clothes for their moms and my hairdresser’s girlfriend. It was a pretty cool way to support myself through school, doing something I loved to do. Cheryl Sleboda: Whether it’s heirloom dimensional fabric manipulations like smocking, pleating, or tucking, or cutting edge technology like LEDs, microprocessors, or circuitry, my work combines design and innovation for unique fabric art. Beth Ferrier: That I needed a new sewing machine was clear. Instead of bringing me joy, I fought with and cried over that stupid Kenmore, the one that I’d paid good money for (more than $200 in 1990, a lot for the time) and expected so much from. Sewing was my haven from the insanity of raising four hyper boys, my quilts were the only thing I did that stayed done. Sandy Fitzpatrick: It didn’t take long for me to realize that I enjoyed creating my own appliqué patterns. When friends started asking me to create patterns of my designs, I realized that perhaps I could turn my fun little hobby into a business, and Hissyfitz Designs became a reality. Mandy Leins: I was taking one of those quizzes the other day that promises to tell you *all about* yourself using on colors/appealing pictures/cat photos and the like, and I realized I already had a pretty good idea of what it would tell me: I love to learn, I love to find human connections in everything, and I love to share. I’m never happier than when all of these things combine. Making things with the work of our hands is a deep part of what defines the human experience, from our earliest origins. We have always found and made meaning in the material objects of our lives, adding art to our craft. @sewbatik #bernina #quilting #terilucasquilts #superiorthreads When you like the back! Kathy Delaney: I will admit to being a frustrated machine quilter. Well, I can’t even call myself a machine quilter, just frustrated. I can’t recall how many machine quilting workshops I’ve taken, trying to master this technique, but it has been many. I feel like I know the mechanics very well and I have even been known to machine quilt a project or two using my BERNINA #50 Walking Foot, but I have never felt like I could call myself a Machine Quilter. Melody Crust: Don’t stress with the process, remember to breath! I like the look of lines that aren’t perfect. I do try to keep them from looking too messy. Depending on how densely you quilt it can be time quite consuming (take breaks! You don’t have to finish quilting all at one time!). The end results are wonderful. Have fun playing with straight lines! Diane Doran: When I think back over all the years I’ve been sewing, and then quilting, the word “magic” keeps popping into my head. That’s how I think of sewing; as a form of everyday magic. Kelly Ashton: We are all multi-faceted individuals, and there are many words that help to describe who we are. Some words that will give you a glimpse into who I am: woman, mother, daughter, wife, friend, Nana. A few others: Quirky. Simple and complex. Loyal. Compassionate. Curious. Stubborn (sometimes). Independent (always). Lynn Harris: My parents bought me my first sewing machine, a portable singer, back when I was in high school. Years later, in 1989, my husband surprised me on my birthday with a BERNINA 1230. He even called my boss and arranged for me to have the day off of work so I could stay home and sew on the brand new machine! To this day it’s one of the best and most used gifts I’ve ever gotten and speaks to how well he knows me. Joanne Sharpe: MY FIRST BERNINA: My first BERNINA machine is a B350 that I purchased while teaching at an art retreat in California in 2011. I live in upstate NY. I wasn’t leaving without my new treasure, my machine, so I took all my clothes from my suitcase and packed them in the BERNINA box and shipped them home. My new BERNINA “baby” went with me on the plane instead, fitting perfectly inside my extended carry-on. But the bad was just a tad too wide for the over head, so the flight attendant graciously placed it in the captain’s closet for the trip home. My machine was already a spoiled child, nice ride! And please remember to visit the Lectures and Workshops Page. My big adventure later this year is being the featured quilter at the Dutchess Heritage Quilt Show. I’m available to come speak at your quilt, host a workshop or a retreat. 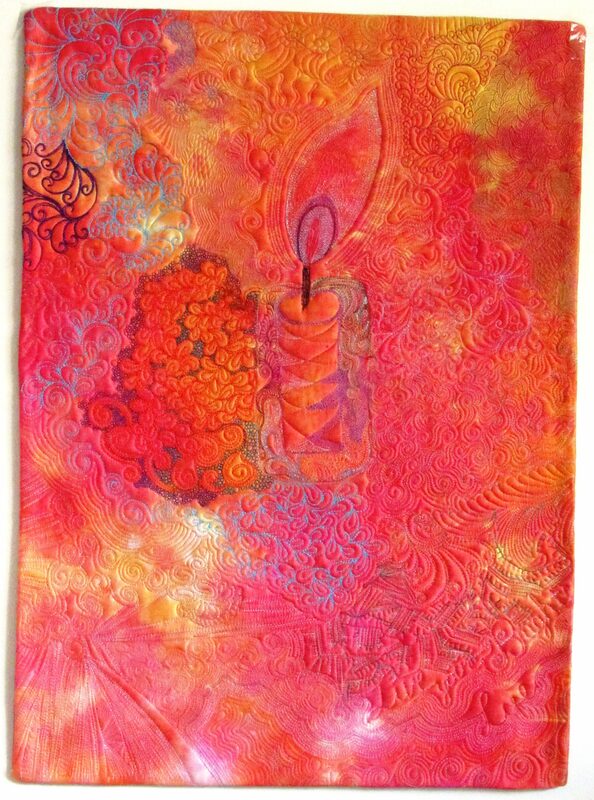 Comment here if you’d like me to send you a quilted card.